I’m just about finished with this project. I decided to pull the dash and have a look at both the heater core (I didn’t have as much front heat as I thought I should have) and to fix a squeaky clutch pedal. Removing the dash has been covered elsewhere, a good reference is on Ben’s Place website. Once the dash is out, the heater box can be removed (clamp off coolant lines). One tool that makes this possible is a phillips bit socket on a long extension. 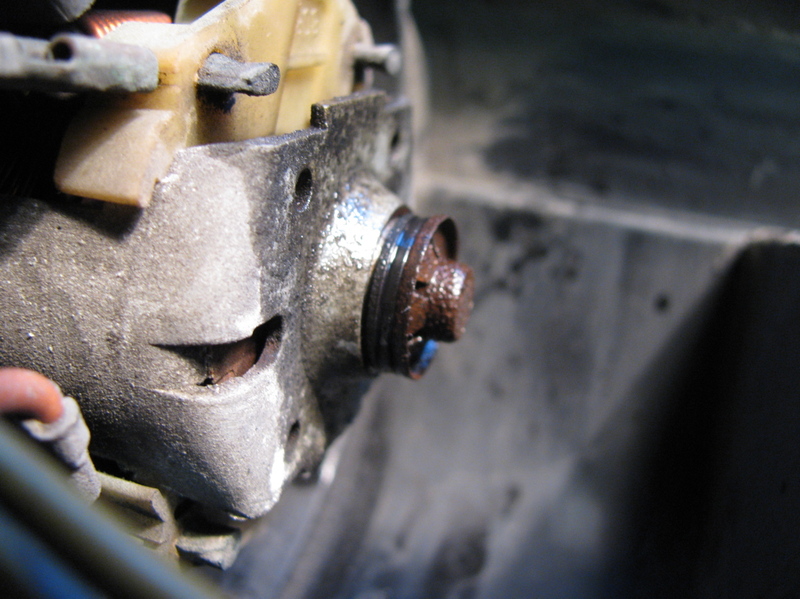 Some of the screws holding the heater box to the van can be rusted in tight, so take care. The heater box is then split along the seam, there are spring clips to remove first (and welded plastic tabs if box has not been split before). Then the heater core comes out and I cleaned it inside an out with a hydrofluoric acid based aluminium cleaner. I diluted the cleaner, it was a pretty strong stock solution. Flushing with the cleaner produced a lot of black sediment, I’m hoping that getting rid of that stuff will improve the heater’s performance. With the dash off its relatively easy to pull the pedal assembly out (after draining brake fluid etc). I have a spare assembly that I rebuilt and talked about in this post, but I decided rather than swap over the units I would rebuild this one. As in the other one, this assembly had a worn hole in clutch pedal and worn clevis pin. But also, the clutch rod was bent. Wonder how that happened? Maybe previous owner had replaced clutch master cylinder and didn’t insert pin correctly and the first time pedal was depressed it bent the rod before it popped into place? I took the chance and straightened it out, then I enlarged the hole in the clutch pedal and clevis to make it round rather than oval, and turned a new, oversized, (and roughly finished) pin. Cleaned everything up, greased, and reassembled. The pedal feels a whole lot better. Now the chore of putting it all back into the van. Nothing special to report here except to note that it is easier to reattach the clutch line to the clutch master cylinder if the mc is disconnected from the pedal bracket. Oh, and a heat gun is needed to soften the plastic vacuum line to the brake booster to get it off, and to put it back on. 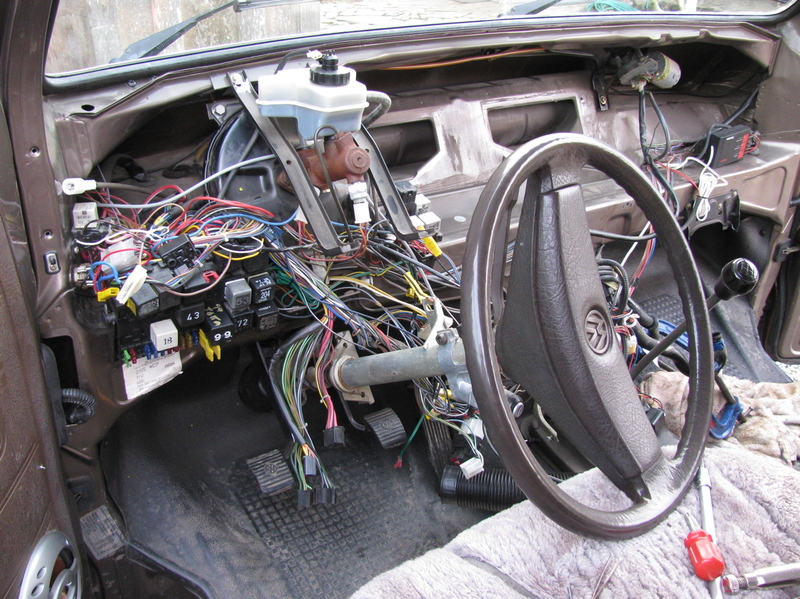 The dash is back in place and tomorrow I’ll be reconnecting the electrics and flushing the hydraulics. This entry was posted on February 1, 2011, 5:27 pm and is filed under syncro, syncro specific repairs, vanagon. You can follow any responses to this entry through RSS 2.0. You can leave a response, or trackback from your own site. Darn, I still have to do this! 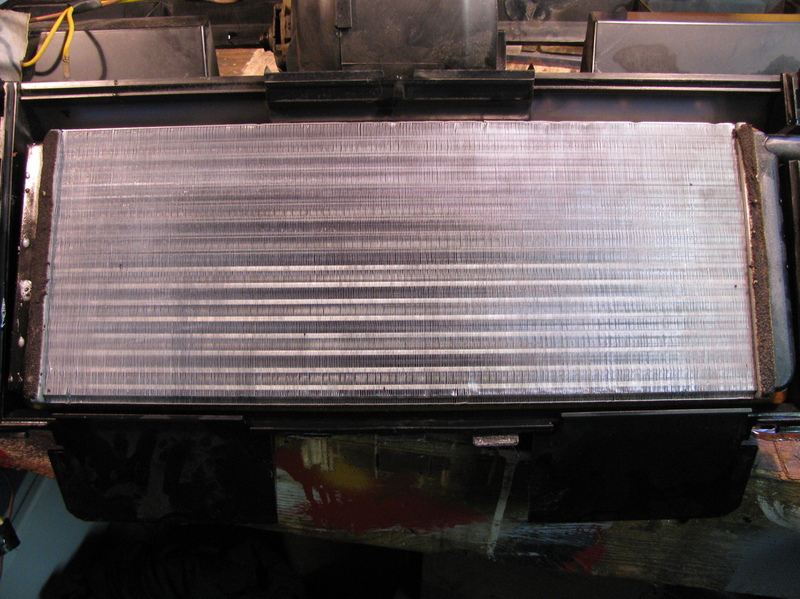 What do you think total time was not including machining new parts and cleaning the heater core? (from completely assembled back to completely assembled again?) Thanks… and nice work as always! Its pretty easy/fast to pull the dash, less than an hour this time. Splitting the heater box, whoops back up, the 6 phillips head machine screws holding the heater box to van might slow you down. Two of them have their ends exposed to the outside and can be rusted. Your really need the long extension on socket and a good fitting bit, and give the buggers a rap with hammer before trying to unscrew. Took me about 20 min. 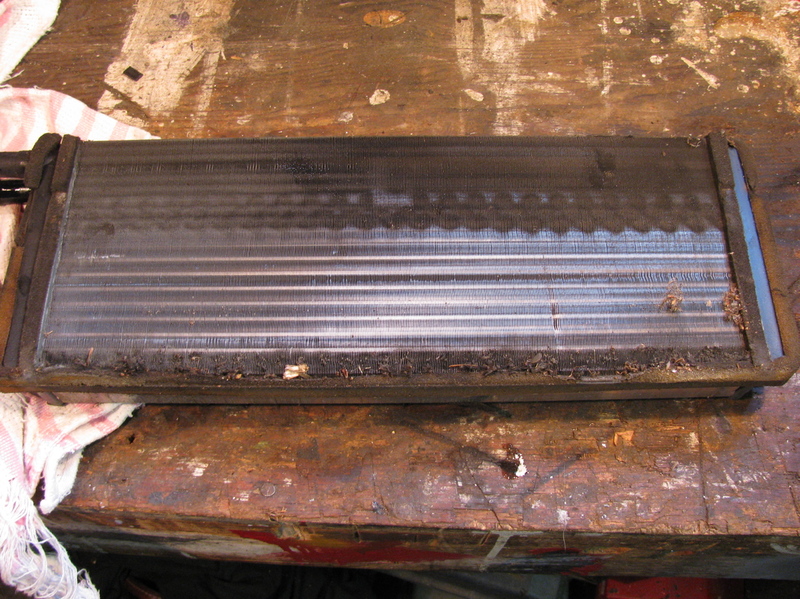 to split the heater box, 30 min to clean the core, and about 10 min to reassemble. The pedal assembly… well with draining the brake fluid and all, it took me about 30 min to get it out. 10 min to take apart, 30 min to clean (washing and drying reservoir too). 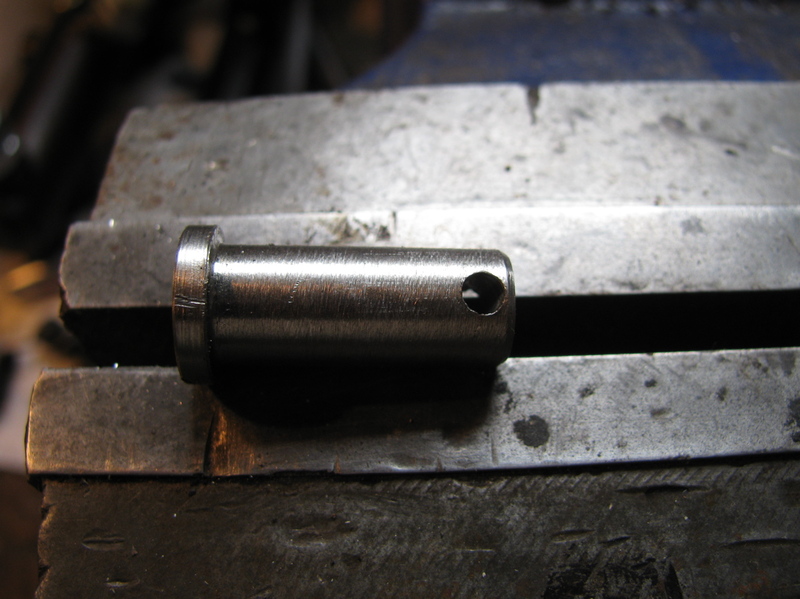 Then making the new pin on the lathe took me an hour… Half that time was spent trying to figure out why my tool bits wouldn’t cut the bit of “scrap stainless rod” I thought I had chucked in lathe. Turned out to be a section of ground and hardened rod used in a linear bearing I was working on last summer. Doh. 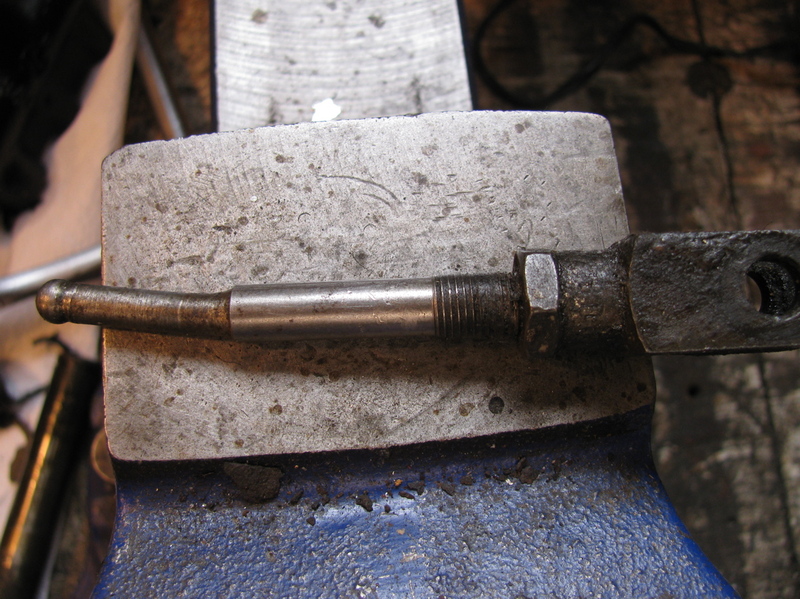 Drilling out pedal and clevis pin took only 10 min. Cleaning and reassembly maybe 15? I too, found reassembly slow going. Fixing wiring messes from previous work. I started on a Friday night. Drove Van to a 0900 Monday morning meeting. Did spend most of Sunday night in the shop working.. I work at a snails pace though! Wow, you are fast. This gives me hope that if I work efficiently it shouldn’t take as long as I thought. Unfortunately both the vanagons in the driveway need to have the front heater cores replaced. On the ‘keeper’ I will rebuild the pedal linkage, as you have documented so nicely, if required, and with over 330 thousand kilometres on the van it is likely required. Thanks again for this and previous info on pedal linkage refurbishing. Not that fast, but had the advantage to taking out a dash a few times before. It would have been faster if i just swapped in my rebuilt pedal assembly, but for some reason I decided to repair. Heater cores seem to be expensive (250-400? ), there was a thread on the samba about substitute ones. To be honest, it took me more time to get the dash in and the brakes fixed than I expected. I suppose you really ought to time budget for those unexpected things. Just confirmed that I will have to pull my pedal assembly. The pin holding the push rod is all jacked and the hole in the pedal arm is ripped completely through. So, if I’m going to pull the dash and the pedal assembly, what else can I do behind the dash while I’m at it? I don’t know of any issue with the heater box, but maybe it’s a good idea to tear I into it in a preventative fashion? Should I add insulation? Replace anything else? This will be my first “major” project, so I’m a bit nervous and timid. Oh well. In I go! 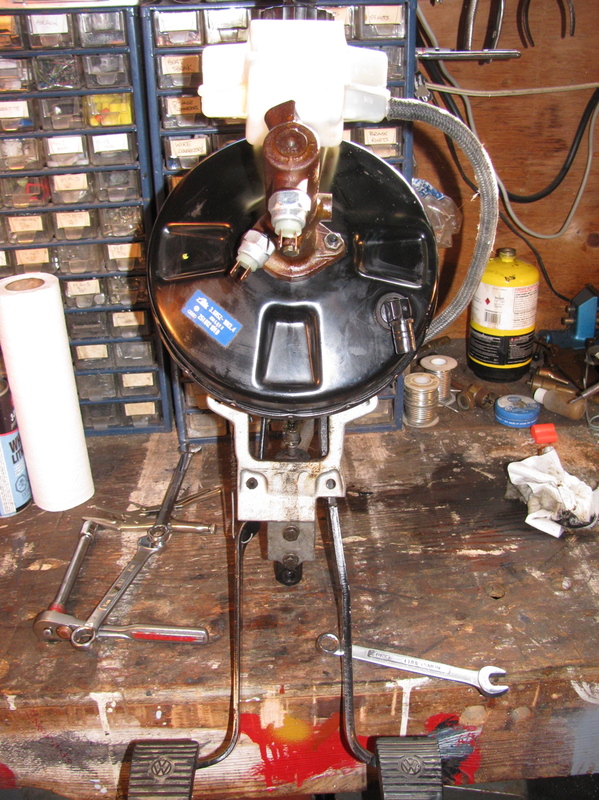 Can you find a new pedal assembly at a wreckers or are you going to weld up and redrill the old one? When you have the dash off it would be a good time to pull the heater box and clean it out. There can be quite a load of “stuff” on the fins of the heater core. If you are lucky ou will find metal clips holding the seam of the heater box together. 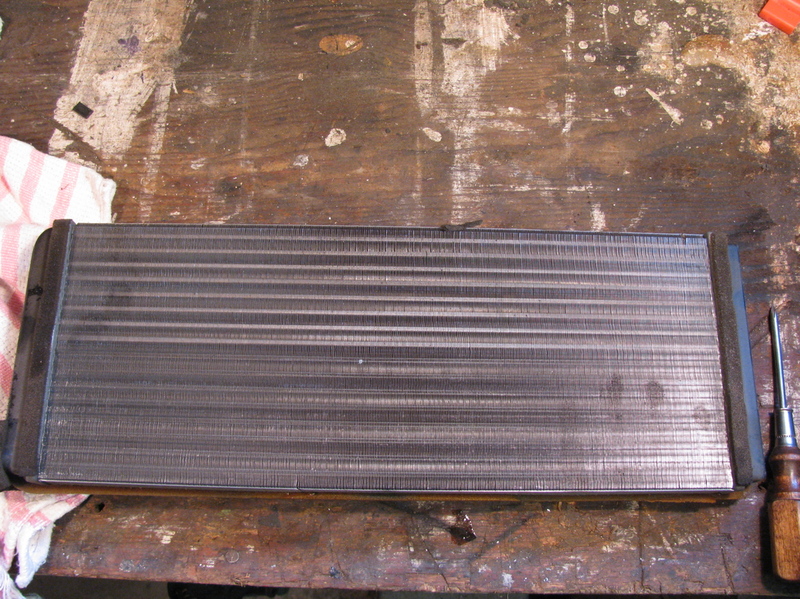 There are also tabs which are plastic welded together (if box has not been opened before). You have to cut those tabs, the metal clips are what hold the box together afterwards. There are 4, or maybe 5, phillips head machine screws that hold the heater box to the van front wall. If you look behind the grill you can see two of those bolt ends. They might be rusty seeing as they are exposed to the weather. Spritz some rust busting stuff on them. 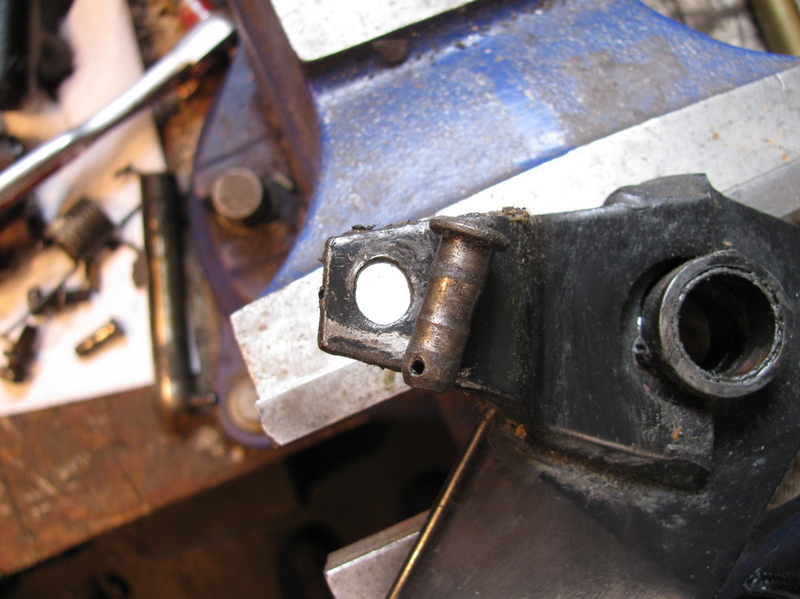 To get the bolts out, it is best to use a 3/8″ socket phillips screwdriver (largish) bit on a long extension. Give the end of the extension a good rap with a hammer to help loosen the bolt before you try with the ratchet. The wiper linkage will be exposed, good time to lube it. And maybe a couple of patches of sound dampener on the sheet metal? I did the latter but did not insulate. Pulling the dash is not hard at all. The tricky parts (I found) was corralling the wiring for my radio, and the heater box attachment bolts. Oh and the heater control face plate, be easy on it, same with the slider knobs. They stick and the plastic is brittle. Mark the heater control cables so you don’t mix them up on re-install, and mark their positions on the clamps.